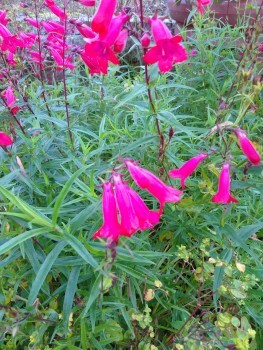 It is that time of year when I enjoy increasing the stock of Penstemons for the following season. From my experience cuttings will still root from thicker stems after the first frosts. If you can bear taking some cuttings now, and spare some of those wonderful flute-shaped flower heads, it is a good productive seasonal task to push on with. Cutting material needs to be carefully selected. Clean sturdy growth is the most suitable. Penstemons root well taken from nodal cuttings, as opposed to internodal. Taking nodal cuttings helps the stem tissue heal at a faster rate. A scar tissue is formed which seals the end of the cutting. I have a small pot of hormone rooting powder to hand but rarely use it. Rooting powder speeds up the process of root formation, but I have experienced that most soft and woody stem cuttings will root without using it. The image showing my finger pointing indicates the best type of rooting/cutting material. At the lower point of the stem it is a green/brown colour, quite woody, this stem material has a higher rooting potential compared to the softer tissue further up the stem. The ideal length of cutting is about 12cm long. I prune back the soft tip tissue to the first strongest growing point. The next stage is to strip away all the leaves and small shoots apart from the two at the tip of each cutting, ideally with the addition of tip shoots within each leaf/stem joint. My propagation experiments with Penstemons have proved to be more successful using stems that comprise strong new tip growth from the point where the leaf joins the stem. I have noticed that this produces a higher flush from the first set of flowers, compared to cuttings without this new tip growth. The established plants in the image in the 2 litre pots were taken from cuttings on 6/11/2013, inserted into 2 parts compost, (peat free) to 1 grit sand, into 1 litre pots. Cuttings can be placed in the cold frame or in the cool end of the glasshouse to over-winter. The cool temperature of between 5-8 centigrade initiates a good root formation. Placing pot plants outside during the first summer. Over winter in the cool glasshouse. Plant out the following summer. This cycle of cultivation produces stronger/healthier plants as growth begins in the open ground. At that stage the plants have been cultivated over a period of about 18 months from cuttings to planting out.